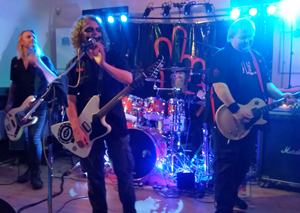 Saturday 8th of September saw a local double header at The Gallows Inn, in Ilkeston, with Dip and Crazy Diamond. A powerhouse night of two well established local bands at the top of their game. If you've never seen either of these bands then that's a problem you need to fix. Keep your eyes peeled on the Steamhead events page, as I'm sure these two bands will crop up some more. Kicking off the festivities were Dip, a band that have been around for so long, they were one of the first bands to get webspace from Steamhead back in its first incarnation in the last century, but despite that, they still seem just as fresh as ever. Dip are one of those Marmite bands, you either get them, or you don't, but when you get them you're in for a treat. To try and define what style Dip fit in is a bit like trying to wrap a model yacht as a Christmas present, nothing really fits, and no matter how hard you try something pokes through the paper. Probably the nearest you could get is imagine if David Bowie, and Toyah Wilcox had a love child that turned out to be sired by Sid Vicious, which doesn't really describe them, but it's fun imagining. The first thing you notice about Dip is they have put some effort into appearance, taking their name from the old Domestic Industrial Pressings factory that used to grace the northern realms of town, they have their own mongrammed work overalls and a slick backdrop. Then just to put you off balance frontman Daz Lawson (guitar/vocals) evokes the spirit of Heath Ledger's Joker. Opening with Wombat, which to put it in context would be a bit like Deep Purple opening with Smoke on the Water, Dip very quickly introduce newcomers to their strange songwriting style, with Scared of Telephones and the thunderous Uncle Les following the opener. 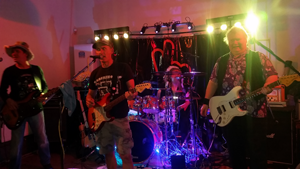 Their sense of humour soon shines through as Daz asks the audience if they like Country, only for Scott Lawson (drums/vocals) to chip in with "I like the first part". Songs get even stranger with Shred the Beef, and such numbers as Psychadelia Smith and Rossiter, and it would be so easy to dismiss these guys as a gimmick, but only if you're not paying attention, with the guitar solo in Visible From Space sounding like it wouldn't be out of place in the headline set at Download. These guys are absolute masters, with Rob Lane and Craig Reynolds both veterens of many bands over the years, completing the 4 man line-up and despite not planning an encore find themselves pulling a great rendition of Henry Thackary out of the back to top off a great opening set. When Crazy Diamond take to the stage you instantly notice some familiar faces with Scott and Craig returning from Dip, for another 90 minutes of rocking. Bass duties are performed by Jono Owen and Hell frontman Dave Bower takes lead vocals and adds a second guitar to the mix to complement Craig. Starting as they mean to go on, they pummel the audience with Burn from Deep Purple, and quickly establish that the highlight of this band is well constructed 4 part vocals, both as harmonies, and throughout a normal night ever member of the band generally gets to lead on at least one song. They boys put on a varied set through the next hour and a half with offerings from Sweet, AC/DC, Kiss, Presidents of the USA, amongst many others. They varied the set, drawing on a great catalog of songs they've built up over the years, bringing back some of my old favourites, like Vanilla Radio and Alice What's the matter, and I even found myself asked up for guest vocals on Don't Believe a word. As well as old Crazy Diamond favourites there were a few surprises in there with Beds are Burning and a fantastic rendition of The Zoo from the Scorpions, with wonderful layered vocals to boot. As the set moved on and the audience warmed up there was plenty of dancing and audience participation, with great crowd vocals in Living After Midnight, and the dancing started to get a little more wild with a Gay Bar/Whole Lotta Love mash up, as the set headed towards the encore with wonderful renditions of Sweet Caroline and Dream on. Overall a great night out, and a fantastic illustration as to how entertaining live music can be.